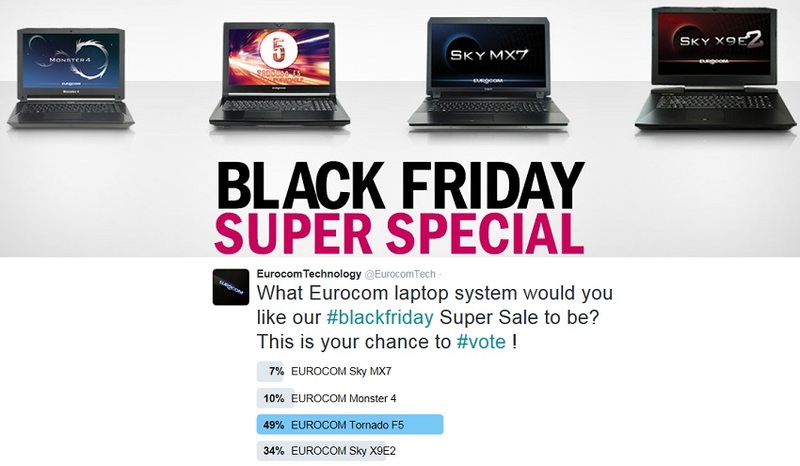 After Eurocom Twitter fans have had their chance to vote, Eurocom is launching Black Friday Super Sales on all systems that were voted on – the 15.6” Tornado F5, 17.3” Sky X9E2, 17.3” Sky MX7 and the 14” Monster 4. “Eurocom received such a great response we decided to discount all of the four system available for voting. We didn’t want to disappoint any of our fans that voted so the Tornado F5, Monster 4, Sky X9E2, Sky Mx7 are all on sale November 24th and 25th!” Mark Bialic, Eurocom President. Over the past week, Eurocom has taken a fresh approach to Black Friday sales. Instead of announcing sales for products that they assumed would be in high demand, they took to Twitter to discover what products the customers wanted to see go on sale. Eurocom offered a choice of four in demand Eurocom systems, and people could vote on Twitter for which ones they wanted for a Black Friday Super Sale. Two candidates shot well above the competition: The Eurocom Tornado F5 (the newest addition to the Eurocom Super Gaming product line) and the SKY X9E2 – the most powerful laptop in the entire world. The two others were the Eurocom Monster 4, a super compact 14” little beast, and the SKY MX7, a thin and light 17.3” system with great performance and beautifully large display. A preconfigured EUROCOM Tornado F5 is also available for a 20% discount for those ready to push the limits or what is possible in a small and portable form factor. The EUROCOM Tornado F5 couples NVIDIA GeForce GTX 1070 graphics, Intel Core i7 6700K processor, 64 GB memory all in a 15.6” chassis for mind blowing performance in a highly mobile chassis. Being fully upgradeable the EUROCOM Tornado F5 can support a variety of MXM 3.0b graphics cards including next generation NVIDIA GeForce GTX 1070, 1060 graphics, NVIDIA GeForce GTX 980M, 970M, 965M as well as professional grade NVIDIA Quadro M5000M, M3000M and M1100M graphics. Utilizing an Intel Z170 Chipset and LGA1151 socket gives the EUROCOM Tornado F5 the ability to support up to the Intel Core i7 6700k processor managing up to 64 GB DDR4 memory. Four drives are supported for up to 6 TB of storage support with two M.2 SSDs and two HDD/SSD. The Sky X9E2 is a VR Ready super high performance supercomputer laptop. Packing a desktop CPU and dual desktop GPU, and supported by an unlocked system BIOS, overclocking a laptop has never been so easy. The Sky X9E2 is so powerful it can utilize two 330 watt AC adapters. The EUROCOM Sky X9E2 is perfect for Virtual Reality developers covering vertical markets from education, training, medical, engineering, entertainment, military and content creators providing them with fully portable VR solution for on-the-go development and testing.